Year-end tax strategies will demand more urgent attention from higher-income taxpayers as the result of President Obama's re-election. The President has consistently called for higher tax rates on individuals with incomes above $200,000 and families with incomes above $250,000 and continuation of the current lower tax rates for others. He campaigned on reinstatement of the 36 percent and 39.6 percent income tax rates for higher-income individuals. The President also advocated a maximum capital gains rate increase from 15 percent to 20 percent and a dividend rate rise from 15 percent to 36 percent or 39.6 percent for higher-income taxpayers. His re-election also ensures that the 3.8 percent Medicare contribution surtax on net investment income will go into effect on January 1, 2013, and continue into the foreseeable future. Before the election, President Obama had predicted Democrats and the GOP could reach a "grand bargain" that permanently resolves the fate of the Bush-era tax cuts, lowers the corporate tax rate and takes a serious step toward deficit reduction with revenue raisers within four to six months. In the interim, both sides may have to settle for a temporary extension of some of the expiring provisions, including some income tax rates, and leave the long-term fate of the Bush-era tax cuts and more to the 113th Congress, which will meet in January 2013. Less than 24 hours after the results were in, House Speaker John Boehner, R-Ohio, said Democrats and Republicans should focus on "common ground" to address the so-called "fiscal cliff." Lawmakers are due back in Washington on November 13. They will break for Thanksgiving later in November and will return in early December. Although the scheduled work period is short, there have been reports of lawmakers engaging in behind-the-scenes discussions about taxes and deficit reduction in the weeks before the election. These discussions could help kick-start serious negotiations between the White House and the GOP. Whether any eventual compromise hammered out between Congress and the Obama Administration would extend lower income tax and capital gains/dividends rates for one more year, into 2013, or allow the higher top rates in 2013 to start at temporarily higher income levels than initially proposed, remains speculative. In the meantime, higher-income taxpayers must decide whether to wait-and-see â€¦ or secure the benefit of current rates now, through accelerating income, postponing deductions/credits, harvesting appreciation/capital gains, having closely-held corporations declare special dividends, closing business sales/acquisitions, and executing family gift-giving strategies—all before year end 2012. While it is not absolutely certain that tax rates will rise in 2013, it is more than certain that rates will never drop lower than they are now in 2012 for most higher-income taxpayers. Winning the White House does not necessarily create a mandate for the President to push through his full agenda. Nevertheless, President Obama's power to veto legislation for four more years will clearly shape upcoming negotiations. Moreover, the 113th Congress retains its familiar profile of a Republican majority in the House and Democratic majority in the Senate (but, as before, without the 60 vote margin to prevent filibuster). Membership on the Congressional tax writing committees for the most part also remains the same after the elections as before. Compromise on issues that have been debated throughout this past year—over both what is fair and what a still-fragile economy can withstand— may be necessary on both sides of the aisle and in the White House before any tax legislation can move forward. In summer 2012, the GOP-controlled House and the Democratic-controlled Senate approved competing bills to extend some of the Bush-era tax cuts. The House also approved a fiscal year (FY) 2013 budget resolution, which would consolidate the current six individual income tax rates to two (10 and 25 percent), repeal the alternative minimum tax (AMT) and reduce the corporate tax rate to 25 percent. Neither the House nor Senate has approved any legislation to extend the 2012 employee-side payroll tax holiday for one more year. More tax extenders expire, joining the ranks of extenders that expired after 2011. Unlike 2010, when the Bush-era tax rates were extended for two years, any extension of the Bush-era tax rates will most likely be accompanied by deficit reduction measures. The extent of those deficit reduction measures is unclear at this time. Among the likely potential revenue raisers are increased taxes on higher-income individuals, accomplished through higher marginal rates and the elimination or curtailment of certain tax preferences. Tax preferences that might be targeted for repeal would most likely include those Impacting business taxpayers, such as certain oil and gas tax breaks and the last-in-first out (LIFO) method of accounting. One scenario calls for Congress approving an AMT patch and other popular expiring extenders in the lame-duck session. The IRS maintains that it cannot wait much longer to issue 2012 tax year forms without delaying the start of the 2013 filing season. Meanwhile, if the law isn't changed, the Congressional Budget Office estimates that over 20 million additional middle-income taxpayers will become subject to the AMT without the so-called "AMT patch" for 2012. With 2012-focused tax legislation, however, there is also speculation that Congress may buy itself some time by enacting a three-month extension of Bush-era tax cuts (to be pro-rated over 2013). An extension of some sort may be necessary because without it, wage withholding at the higher tax rates would become mandatory for all taxpayers at all income levels. Take home pay will also be immediately reduced if Congress does not extend the employee-side payroll tax holiday, or enact some replacement for it. The employee-share of OASDI is scheduled to return to 6.2 percent instead of 4.2 percent (up to the 2013 Social Security wage base of $113,700). Proponents of an extension maintain that the economy cannot take the hit on consumer spending that would result from a sunset of the payroll tax holiday; opponents argue that it is temporary tax relief that the nation can no longer afford. President Obama campaigned on a promise to extend the Bush-era tax cuts for lower and moderate income individuals, but to allow them to expire for higher-income individuals. The President is not expected to change his position after the election, but there could be some compromises on the income thresholds that trigger the higher rates. If Congress approves the President's proposal, the individual income tax rates would be: 10, 15, 25, 28, 33, 36, and 39.6 percent for 2013 and subsequent years. Alternatively, Congress could extend all of the Bush-era tax rates through 2013 or, in a deadlock, take no action and allow the Bush-era tax rates to sunset. Full sunset for lower and middle-income taxpayers—which would reinstate a 15, 28, 31, 36 and 39.6 percent bracket structure—is highly unlikely from a political and economic standpoint. Under President Obama's proposal, the 36 and 39.6-percent rates would start at a higher-income bracket level of $200,000 for single filers, $250,000 for joint filers, $225,000 for head-of-households, and $125,000 for married taxpayers filing separately. Since these thresholds were initially proposed in 2009, they would also be indexed for inflation. Also they would be keyed to adjusted gross income (AGI) rather than taxable income. Indexed 2013 projections for those AGI levels, based on the Administration's FY 2013 Budget, are $213,200 / $266,500 / $239,850 / and $133,250, respectively. As part of the automatic sunset of Bush-era tax benefits, after 2012 higher-income taxpayers also would once again be subject to the Personal Exemption Phaseout (PEP) and the Pease Limitation on itemized deductions (named for the member of Congress who sponsored the legislation). Alternatively, President Obama has proposed replacement of the PEP and Pease Limitation with a limit on the value of itemized deductions for higher-income taxpayers. The President would limit the value of otherwise allowable deductions to 28 percent of AGI for those in his proposed 36 and 39.6 percent tax brackets. During the campaign, the President said he saw no way to accommodate Governor Mitt Romney's plan to reduce the individual income tax rates by 20 percent across the board in exchange for a reduction in the number of deductions and loopholes currently available. Obama maintained that he would not support a proposal in which "the numbers don't add up." The IRS has delayed issuing some 2013 inflation adjustments, including those affecting tax rate brackets, pending action by Congress. The IRS is expected to move quickly to release these inflation adjusted amounts as soon as legislation is passed by Congress and signed by the President. President Obama campaigned on allowing the Bush-era tax cuts—including the reduced capital gains and dividend tax rates—to expire for higher income individuals, and he is not expected to change his position now. Under the President's proposal, the current zero and 15 percent capital gains and dividend tax rates would be extended after 2012 for single individuals with incomes below $200,000 and families with incomes below $250,000. The President's proposal would increase the tax rate on qualified capital gains to 20 percent for single individuals with incomes over $200,000 and married taxpayers filing a joint return with incomes over $250,000. Regarding dividends, single individuals with incomes over $200,000 and families with incomes over $250,000 would pay tax on their dividends as ordinary income. For dividends, the increase in tax rate for higher-income taxpayers represents almost a 300 percent increase when a top 39.6 percent rate is combined with the new 3.8 percent Medicare contributions tax on net investment income (NII). Combined with a jump in the capital gains rate from 15 percent to 20 percent (23.8 percent with the NII tax), some economists are predicting a massive market sell-off at year end as taxpayers engage in basis-resetting strategies and reallocation of portfolio assets. To create a softer landing, one proposal would raise rates for taxpayers only with incomes above $1 million, at least for the 2013 period until a more permanent structure under the umbrella of tax reform could be enacted. Under current law, taxpayers in the 10 and 15 percent income tax brackets pay zero percent tax on qualified capital gains and dividends. If the alternative minimum tax (AMT) exemption amounts are not patched for 2012, they would be dramatically less than the exemption amounts for 2011. Under current law, the AMT exemption amounts for 2012 are $33,750 for single individuals, $45,000 for married couples filing joint returns and surviving spouses, and $22,500 for married couples filing separate returns. In comparison, the AMT exemption amounts for 2011 were $48,450 for single individuals, $74,450 for married couples filing joint returns and surviving spouses, and $37,225 for married couples filing separate returns. In early 2012, President Obama proposed replacing at least a portion of the AMT with the so-called "Buffett Rule," essentially the principle that millionaire taxpayers should not pay a smaller effective rate of income tax than middle-class families. Although the Senate voted on a version of the Buffett Rule, the proposal was never taken up by the House. In announcing the Buffett Rule, President Obama asked Congress to pass measures that ensure individuals making over $1 million a year pay a minimum effective tax rate of at least 30 percent. The Senate approved the legislation that would subject taxpayers earning over $2 million to a 30 percent minimum federal tax rate. The tax would be phased in for individuals with incomes between $1 million and $2 million, with those taxpayers paying a portion of the extra tax required to get them to a 30 percent effective tax rate. The need for an AMT patch retroactive to the start of 2012 may force the lame-duck Congress to consider at least a small tax bill before 2013 in order to give the IRS time to finalize 2012 tax forms and start the 2013 tax return season on time. Proposals for replacing or repealing the AMT appear to be made as long-term solutions. The AMT brings in a considerable amount of revenue and cannot be easily replaced. A tax on millionaires may not bridge that revenue gap. A solution that is rolled up into the umbrella of overall tax reform appears to be one focal point for tax policy now being pursued. After 2012, the $1,000 child tax credit is scheduled to revert to $500 per qualifying child. President Obama campaigned on the promise to make permanent the $1,000 child tax credit and is expected to support legislation that will do so. Taxpayers who cannot take full advantage of the child tax credit because the credit is more than the taxes they owe may receive a payment for some or all of the credit not used to offset their taxes. The 2010 Tax Relief Act reduced the minimum earned income amount used to calculate the additional child tax credit to $3,000. President Obama has proposed to make permanent the $3,000 threshold. Few provisions in the Tax Code have been as uncertain in their long-term fate as the federal estate tax. In 2001, Congress set in motion a gradual reduction of the federal estate tax rate and repealed it for estates of decedents dying in calendar year 2010. Under the 2010 Tax Relief Act, federal estate taxes again applied to estates of decedents dying after December 31, 2009, and before January 1, 2013 (although estates of decedents dying in calendar year 2010 could opt out of the federal estate tax and apply a modified carryover basis regime). President Obama has proposed extending the federal estate and gift tax under parameters in effect for calendar year 2009 for estates of decedents dying after December 31, 2012. That level would set the estate tax exclusion at $3.5 million with a 45 percent rate and the gift tax lifetime exclusion of $1 million. Absent Congressional action, the maximum estate tax rate is scheduled to be 55 percent for estates of decedents dying after 2012 with a $1 million combined estate and gift tax exclusion amount. Opponents of the estate tax continue to maintain that it hurts family-owned businesses to the detriment of the economy. For 2012, a unified estate and gift tax exclusion stands at $5.120 million, with a 35 percent rate imposed on the excess. The exclusion effectively becomes $10.24 million for married couples. Depending upon a wealthy individual's estate plan and the type of assets held, some practitioners recommend making large gifts before 2013 to take advantage of the $5.12 million/$10.24 million amounts that may be transferred gift-tax free before 2013. The re-election of President Obama makes the repeal of the estate tax or a higher exclusion unlikely. President Obama has also proposed to extend the generation skipping transfer (GST) taxes at parameters in effect for calendar year 2009. The 2010 Tax Relief Act also provided for portability, which increases the surviving spouse's lifetime exclusion for estate and gift taxes by the portion of the deceased spouse's exclusion that is unused at the deceased spouse's death. Portability is scheduled to sunset after 2012. President Obama has proposed to extend portability. The payroll tax holiday reduced the employee-share of Old Age, Survivors and Disability Insurance (OASDI) taxes from 6.2 percent to 4.2 percent for calendar year 2012 up to the Social Security wage base of $110,100. The wage base for 2013 will rise to $113,700. Self-employed individuals benefit from a comparable rate reduction for calendar year 2012. A two percent payroll tax cut in 2013 would amount to $2,274 in savings for all wage earners at or above the $113,700 wage base. On the campaign trail, President Obama did not specifically call for extending the payroll tax holiday for another year. However, some Democratic leaders in Congress have said that the payroll tax holiday should be extended. It is unclear at this time if President Obama will push for an extension of the payroll tax cut, or an equivalent substitute, as part of a year-end tax package. On the campaign trail, President Obama called for a reduction in the corporate tax rate. Such a reduction has broad bipartisan support, although there remains disagreement over the proper tax rate and the specific revenue offsets that would be used to broaden the tax base. However, because there is consensus that a reduction in corporate income tax rates would be good for business and good for the country, Congress is expected to enact corporate tax reform, although it may take until late 2013 or 2014 to do so. President Obama has said that any cut in the corporate tax rate must be revenue neutral. That means certain business tax preferences are likely to be eliminated in exchange for the reduction. President Obama has repeatedly urged elimination of tax preferences for oil and gas producers, which could be used to partly offset the cost of a corporate tax cut. In early 2012, President Obama unveiled a Framework for Business Tax Reform in which he proposed reducing the maximum corporate tax rate from 35 percent to 28 percent, with a reduced effective rate of 25 percent for qualified manufacturers. Any discussions for a grand bargain could include moving the U.S. from a worldwide system of taxation to a territorial system of taxation, but this is unlikely to be a priority. On the other hand, proposals made by the President in early 2012 to reward employers that move operations from overseas plants to the U.S. with a tax credit could be revived. President Obama also proposed to give employers that increase payrolls a tax credit. This proposal also could be revived in year-end negotiations. Enhanced Code Sec. 179 expensing is scheduled to expire after 2012. Unless extended, the current expensing amount of $139,000 (as indexed for inflation) is scheduled to fall to $25,000 and the current $560,000 investment limit (as indexed for inflation) is scheduled to fall to $125,000. Some compromise over extending expensing at a higher level into 2013 appears possible. Earlier this year, the Senate approved legislation to provide for a Code Sec. 179 maximum dollar amount of $250,000 and an $800,000 investment limitation for tax years beginning after December 31, 2012. The House approved legislation to extend the Code Sec. 179 small business expensing parameters originally put in place in 2003 ($100,000 and $400,000, respectively) through 2013. These amounts would be indexed for inflation for 2013, which the House GOP estimated at $127,000 and $510,000, respectively. Disincentives to passing an expensing extension include its cost and what offsets may be used. Bonus depreciation at its current 50 percent rate is scheduled to expire after 2012 (after 2013 for certain transportation property and longer-lived property). It is unclear if President Obama will support an extension of 50 percent bonus depreciation. Linked to the Bush-era tax cuts are a package of so-called tax extenders. These are popular but temporary tax incentives. Many of the tax extenders were effective only through 2011 but may be retroactively extended for the entire 2012 tax year by the lame-duck Congress. Others were extended through 2012. Before his re-election President Obama called for extension of the higher education tuition deduction, AMT relief (the AMT "patch"), the enhanced Work Opportunity Tax Credit (WOTC) for veterans, and the production tax credit for wind energy projects, among other extenders. Now that he has been re-elected, there is nothing to indicate that the President will withdraw his support for extending these provisions. The question is: will lawmakers go along with the President's proposals and when will they act? Democrats and Republicans generally agree that the longer they wait to extend some or all of the extenders, the greater the likelihood of a delayed 2013 filing season. The IRS is preparing to process 2012 returns under the tax law as it now reads. The IRS will need time to adjust its processing systems for late legislation. In past years, the tax extenders were routinely approved by Congress, either at year-end or early in the subsequent year and made retroactive. This year may be different. Some lawmakers have balked at the estimated $200 billion cost over 10 years of extending all of these tax benefits. However, it is unclear which extenders, if any, would be allowed to expire. In August, the Senate Finance Committee (SFC) approved the Middle Class Tax Relief Act of 2012, which did not renew some of the tax extenders (such as brownfields remediation expensing and the first-time homebuyer credit for the District of Columbia); but these extenders could be added back before the passage of a final bill. The tax extenders may also be held up by legislation unrelated to taxes. Some lawmakers are upset that Congress recessed before the November elections without passing a farm bill and drought disaster relief. They have promised not to move on the extenders or other legislation until Congress acts on a farm bill. ARE SOME TAXES GOING UP? "We've identified tax rates going up to the Clinton [pre-2001] rates for income above $250,000; making some adjustments in terms of the corporate tax side that could actually bring down the corporate tax overall, but broaden the base and close some loopholes. That would be good for our economy, and it would be good for reducing our deficit." The individual tax extenders can be divided into two categories: Extenders that are good candidates for renewal and extenders that are on the fence. This assessment is based upon both the support, or lack thereof, that the Obama Administration has given to each and how receptive members of the Congressional tax writing committees have been to each. No one can predict what Congress will ultimately do but the higher education tuition deduction, the state and local sales tax deduction, the teachers' classroom expense deduction, and charitable distributions from IRAs appear to enjoy strong support for extension. These incentives could be extended for one year (through 2012) or for two years (through 2013). In September, a bipartisan group of about 60 House members from states without an income tax called for extension of the state and local sales tax deduction. The Code Sec. 25D residential energy efficient property credit is available for qualified property placed in service before January 1, 2017. Qualified property includes certain geothermal energy property and small wind energy property. Like the individual extenders, the business extenders can be divided into two groups: good candidates for renewal and extenders on the fence. The research tax credit, which expired after 2011, enjoys strong bipartisan support in Congress, with many lawmakers and the White House calling for a permanent credit. The research tax credit is likely to be extended for one year (through 2012) or two years (through 2013). Under current law, employers can take advantage of an enhanced WOTC for hiring qualified military veterans. The enhanced WOTC for veterans is scheduled to expire after 2012 but is a good candidate for renewal. However, it is unclear at this time if the WOTC for other target groups, which expired after 2011, will be extended. During the campaign, President Obama called for extension of the production tax credit for wind energy projects, which is scheduled to expire after 2012 (and after subsequent years for other projects). However, extension of the production tax credit faces significant hurdles in the GOP-controlled House. Brownfields remediation expensing and the credit for energy efficient homes were two incentives not included in the SFC's Middle Class Tax Cut Relief Act of 2012. President Obama campaigned on making permanent the temporary American Opportunity Tax Credit (AOTC). The AOTC, which is an enhanced version of the HOPE education credit, is scheduled to expire after 2012. The AOTC applies to 100 percent of the first $2,000 of qualified tuition and related expenses and 25 percent of the next $2,000, for a total maximum credit of $2,500 per eligible student. Additionally, the AOTC applies to the first four years of a student's post-secondary education. The AOTC also allows for partial refundability for qualified taxpayers. If the AOTC expires, it will be replaced by the traditional HOPE education tax credit. After 2012, the $2,000 annual contribution amount for Coverdell education savings accounts (Coverdell ESAs) is scheduled to revert to $500. At the same time, the expanded definition of qualified education expenses for elementary and secondary school would also expire. Under current law, certain enhancements to the student loan interest deduction are scheduled to expire after 2012. If not extended, the incentive would only be available for the first 60 months after repayment begins and would phase-out for taxpayers with adjusted gross income between $40,000 and $55,000 ($60,000 and $75,000 for married couples filing joint returns). In 2012, the GOP-controlled House attempted to repeal all or parts of the Affordable Care Act, but the bills died in the Democratic controlled Senate. It is unclear if this pattern will be repeated in 2013. The House GOP has strongly signaled its opposition to the IRS's proposed regulations on the Code Sec. 36B premium assistance tax credit and is likely to continue to oppose them. The GOP controlled House may also try to reduce funding to the IRS and other federal agencies responsible for implementing the Affordable Care Act. The U.S. Supreme Court upheld the Affordable Care Act's individual insurance mandate in NFIB v. Sebelius, 2012-2 ustc ¶50,573. However, opponents argue that the employer's shared responsibility payment was not addressed by the Court in NFIB v. Sebelius. Some taxpayers have also challenged the Affordable Care Act's contraceptive provisions. The Affordable Care Act imposes a 3.8 percent Medicare contribution tax on the unearned income of higher-income individuals, estates and trusts effective January 1, 2013. The Medicare contribution tax applies to net investment income (NII), and will generally apply to passive income. The Medicare contribution tax also applies to capital gains from the disposition of property. For individuals, the Medicare contribution tax will apply to the lesser of the taxpayer's NII or the amount of "modified" adjusted gross income (AGI with foreign income added back) above a specified threshold. The modified AGI thresholds for individuals are $250,000 for married taxpayers filing jointly and surviving spouses; $125,000 for married taxpayers filing separately; and $200,000 for single taxpayers and heads of household. These threshold amounts are not indexed for inflation. The Medicare contribution tax is not applicable to income derived from a trade or business, or from the sale of property used in a trade or business. NII for purposes of the Medicare contribution tax includes gross income from interest, dividends, annuities, royalties, and rents, provided this income is not derived in the ordinary course of an active trade or business; gross income from a trade or business that is a passive activity (within the meaning of Code Sec. 469); gross income from a trade or business of trading in financial instruments or commodities; and net gain (taken into account in computing taxable income) from the disposition of property that is not held in an active trade or business. The IRS is expected to issue guidance about the 3.8 percent Medicare contribution tax before year-end. Higher-income taxpayers also are faced with a top rate on ordinary income of 39.6 percent and a 20 percent capital gains rate if the President follows through on his campaign promise to allow the Bush-era tax cuts to expire for these higher-income taxpayers. That creates an effective top rate of 43.4 percent on all NII-taxed income, except capital gains, which will be taxed at a 23.8 percent effective top rate. The Affordable Care Act also imposes an additional 0.9 percent Medicare tax on higher-income individuals, effective January 1, 2013. The additional Medicare tax applies to total wages, other compensation, and self-employment income that exceeds the applicable threshold amount for the individual's filing status. The threshold amounts are (not adjusted for inflation): $200,000 for individuals; $250,000 for married couples filing a joint return; and $125,000 for married couples filing separate returns. For tax years beginning after December 31, 2012, the Affordable Care Act increases the 7.5 percent threshold for itemizing medical expenses to 10 percent. However, the Affordable Care Act temporarily exempts individuals age 65 and older from the 10 percent threshold. Taxpayers (or their spouses) who are age 65 or older before the close of the tax year may continue to apply the 7.5 percent threshold for tax years ending before 2017. For AMT purposes the itemized deduction threshold for medical expenses remains unchanged at 10 percent. After 2012, the Affordable Care Act caps the maximum salary reduction contribution to a health flexible spending arrangement (health FSA) at $2,500. Salary reductions in excess of $2,500 will subject the employee to tax on distributions from the health FSA. The $2,500 limit will be indexed for inflation for tax years beginning after December 31, 2013. Effective January 1, 2011, the Affordable Care Act prohibited health FSA dollars from being used to reimburse the cost of over-the-counter medicines (except insulin). The Affordable Care Act imposes a 2.3 percent excise tax on the sale of qualified medical devices by manufacturers, producers and importers after December 31, 2012. The excise tax does not apply to many medical devices that are commonly purchased by consumers such as eyeglasses, contact lenses, hearing aids and other devices generally sold to the public at retail for individual use. For true tax reform to move forward, Washington observers maintain that the full weight of the White House must be behind it. They point to former President Ronald Reagan's leadership that was necessary in 1986 to combine the force of the White House, Treasury Department and the IRS in accomplishing the last major overhaul of the Tax Code. Based upon President Obama's campaign statements, the President may be ready to make such a commitment to help establish a legacy for his second term. "The Committee recognizes that a complex, burdensome, anti-growth tax code remains a significant obstacle to economic recovery and job creation. Accordingly, the Committee anticipates continuing its extensive efforts to simplify and reform the tax code for individuals, families, and employers..."
In the weeks leading up to the November elections, a number of lawmakers from both parties said that the Simpson-Bowles Plan (named for the co-chairs of the 2010 Presidential Commission on Fiscal Responsibility and Reform, Alan Simpson and Erskine Bowles) could serve as a framework for a tax and deficit reduction package in the lame-duck Congress and then for a more comprehensive overhaul of the Tax Code in the 113th Congress. President Obama appointed the 18-member commission of 10 Democrats and eight Republicans in early 2010. The commission, which met throughout 2010, issued its final report in December 2010. While the commission failed to reach a super-majority (14 of 18 members), members of Congress and the Obama Administration are now suggesting that the Simpson-Bowles plan be given a second look, to serve as a base from which both Democrats and Republicans can find common ground. Stabilize the national debt by 2014, and reduce it to 60 percent of GDP by 2023 and 40 percent of GDP by 2035. Various proposed tax reform plans would eliminate many income tax expenditures, simplify others and use the revenue to lower the individual income tax rates. The Simpson-Bowles plan projected that elimination of all deductions and credits would achieve a bottom individual tax rate of eight percent, a middle individual tax rate of 14 percent and a top individual tax rate of 26 percent. Some tax expenditures, such as the child tax credit, the earned income tax credit (EIC), the deduction for charitable contributions, and the deduction for home mortgage interest, would likely survive tax reform, many observers admit. However, retaining these incentives, or any others, would need to be offset by higher individual income tax rates. Flow-through of business income to the individual tax returns of sole owners, individual partners and S corporation shareholders creates a coordination problem in trying to align individual tax rates with proposed changes under corporate tax reform. Tackling both individual and corporate tax reform at the same time, however, may prove to be too large an undertaking. Treasury officials in the Obama Administration have appeared to favor concentrating on corporate tax reform first. Under the Simpson-Bowles plan, all capital gains and dividends would be taxed at ordinary income rates (which will have been lowered by the elimination of tax expenditures). 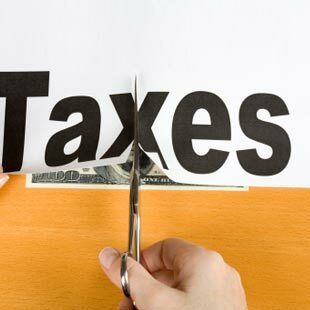 The plan notes that the effective tax rate on investment income could be reduced by excluding a portion of capital gains and dividends (for example, 20 percent) from income. However, to offset this exclusion while maintaining progressivity, the top tax rate on ordinary income would have to be increased. Many business tax expenditures would also be eliminated under the Simpson-Bowles plan and similar plans that aim to reduce the corporate tax rate. The Simpson-Bowles plan projects a top corporate tax rate of between 26 percent and 29 percent, contingent upon elimination of business tax expenditures. The Simpson-Bowles plan specifies only a handful of business tax expenditures for elimination. These include the Code Sec. 199 domestic production activities deduction, and the Last In/ First Out (LIFO) method of accounting. The Obama Administration, in contrast, has made Code Sec 199 a centerpiece in providing a 25 percent effective tax rate for manufacturers under its corporate reform proposal issued in February 2012. The Administration's FY 2012 Revenue Proposals (the "Green Book"), on the other hand, recommends repealing the LIFO method of accounting for inventories, a proposal that has been opposed by certain industry groups. The Simpson-Bowles plan would gradually move the U.S. from a worldwide system of taxation to a territorial system of taxation. Under a territorial system, income earned by foreign subsidiaries and branch operations would be exempt from U.S. taxation. The taxation of passive foreign-source income, however, would remain unchanged.